Is it OK to substitute one for the other? Chives are an herb, green onions are part of...well an onion. They are often used in similar ways and in similar dishes. You can substitute one for the others in most cases, but I could not say they are interchangeable. They have distinct flavors and it will change the dish to change the ingredient. Also do not attempt to replace green onion with dried chives 1-to-1 (or fresh chives for that matter). Dried chives, not uncommonly found in pre-packaged spice racks, have about as much flavor as straw and will not deliver the desired result (unless you like straw). They're not the same thing, as they're a different plant, but they're part of the same family. You might be able to substitute the tops of green onions (scallion, spring onion) in place of chives in small quanities. Chives tend to be smaller and more tender, typically used raw, and only the green portion is used. 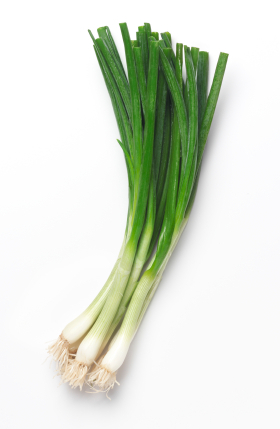 Green onions often use both the whites and the green part, has a more pronounced flavor, and is used both cooked and raw. So, if you're going to substitute chives for green onion -- use the greens only, and reduce the amount. If you're going to go the other way, you'll want to look to see what parts are being used. If it's the whites of the green onion you need, use regular white onion, if it's the greens, then you can try chives, but add them as late as you can in the cooking process, and if it was to be used raw, you might need to increase the amount. No and Yes. They are different plants, but they are very substitutable (am I making up words?). A quick google of chives vs green onions will provide you with more info than you ever needed. Green onions (bunching onions, scallions, and spring onions) are Allium fistulosum (or in uncommon cases Allium cepa), and chives are Allium schoenoprasum. So, they're different species. Chives are smaller, thinner, softer, and in my opinion, milder (although they can have some heat to them, when raw; I meant milder as in flavor—not as in less hot; green onions can have heat, too, but the ones I've tried have been mostly not very hot at all, but with very rich flavor). Chives seem to have a grassier flavor. Not every kind of green onion, even of the same species, tastes the same. For instance, Crimson Forest and He Shi Ko have pretty different flavors, but they're both excellent. I like Crimson Forest in raw salsa and He Shi Ko in frittatas. I've had ones from the grocery store (in salads and stuff) which have more of a generic onion taste than those I just mentioned (which I've been growing, and which are definitely different). We grow our own chives, too; they taste similar to the grocery store kind. People often use chives to top things like sour cream on baked potatoes. I personally like them in much greater quantities, but it's rare for people to do that. Green onions aren't quite as delicate for topping dishes, but you could do it, if you like the way it looks, and don't mind the added texture. If you want green onions to have a milder flavor, you can feeze them, or cook them a little before using. Cooking them more than a little dilutes the flavor a lot (although this may depend on the variety; I think He Shi Ko may retain more flavor when cooked than Crimson Forest). Green onions, in my experience, produce a strong, pleasant smell when you first start to cook them. I'm not sure if chives do that (I usually cook them in sauces), but chives can retain some flavor when fully cooked, if you use enough of them (that's my experience; fully cooked Crimson Forest green onions don't have much flavor, in my experience). In my limited experience, green onions are better partially cooked, cooked not for very long, or raw. Chives are great raw, too. These are my opinions, which may change as I try new varieties (I just planted a bunch; so, ask me in a couple years if I don't update this). I recommend experimenting. It's pretty fun and easy to experiment with these, IMO. There are multiple varieties of chives, too (e.g. Nelly, ProEasy, and the standard type)—I don't know if they all taste exactly the same; I've only tried regular chives when it comes to that species. Garlic chives, which taste like garlic (and I really like them), also exist, but they're a different species (Allium tuberosum). They're a lot like regular chives, other than the taste and how they flower more intensely (and are probably more invasive). Chives produce a lot of flowers, which are also edible. Green onions will produce taller scapes, and probably one flower per plant. People eat flowers of chives, sometimes, but they're a lot hotter than the leaves. You could cook with them if you don't mind the look of the petals in your dish. In short, both chives and green onions have onion tastes (but there are different kinds of onion tastes). Chives are more decorative. Green onions seem to me to provide more flavor, except when fully cooked (at least for Crimson Forest; some are designed for cooking and probably retain more flavor). All of them are great, and I think if you use them interchangeably, it won't harm the flavor in many recipes—although it may taste different, and may look different. Whether they're interchangeable depends a lot on what you're doing, and how picky you are. It's kind of like the difference between the red, white, and gold potatoes they have in the grocery store. They can be used similarly, but they look and taste different. Chives and green onions are not the same thing. Simple they are coming from same plant. one of It's call spring onion(onion leaves) the others(chives) are call their flowers !. What's the difference between green, white, and red onions? How to remove dirt from inside green/spring onions?